We pride ourselves on providing large selection of the best brands at fair prices every day. From our founding in 2006, we have been dedicated to this mission. We are family owned and are proud to be supported by millions of customers, most of whom are return shoppers, happy with their Rennde shopping experience. Our inventory is purchased direct from big box department stores, so the items you purchase with us are the very same you see at the mall, but for a fraction of the price. For customer service inquiries or to initiate a return, please contact Rennde at cs@rennde.com or 954-507-1195. You can initiate a return for most new and unopened items within 30 days from delivery for a full refund. Returns must be unworn and include all original tags/packaging. We must receive your returned items at our processing facility no later than 45 days from delivery. Buyer covers return shipping costs. For fulfillment errors and/or defects, please contact Rennde customer service. 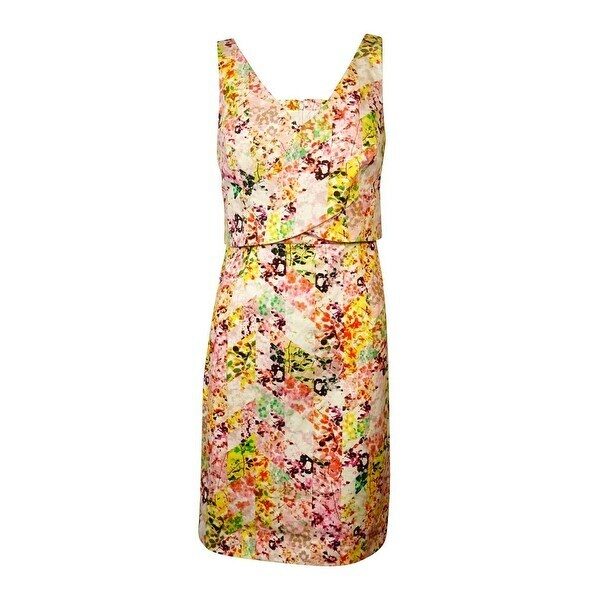 Dress features full lining, flower print, wrap top, v-neck, sheath silhouette, and concealed back zipper. Make choosing a beach wedding outfit easy with these easy tips. Shop and save money on your beach wedding outfit at Overstock.com. Common Dress Terms and Definitions from Overstock.com. Our guides provide customers with common dress terms and definitions. Finding Clearance Dresses Online from Overstock.com. Our guides provide customers with information about finding clearance dresses online.